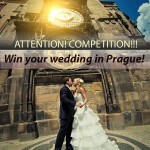 Wedding in Prague now is available for everyone!We prepared the packages for any taste! Compare the prices on the packages and choose the place of the ceremony! If you are NON-RELIGIOUS couple, but still want to get married in the CHURCH — we have a SOLUTION! A great alternative for your wedding in Prague can be the Mirror Hall at Alchymist Grand Hotel & Spa in the heart of Prague! Airport transfer, limousine, photo, video, excursion, hair dress, make up & the bouquet — all this & more is waiting for you in case of order the Ultra All Inclusive package! According to the statistics of 2019, we prepared for you TOP 10 popular wedding venues in the Czech Republic. Book your wedding on 19.9.2019! If you have decided on the wedding location, hurry up to book a wedding date! You can’t choose your wedding venue? Have a look on videos of our couples! Welcome to the wedding paradise!